Delhi Technological University has a 77- year-old legacy of excellence in education and technology development. Our vision, at DTU, is to be a world class university through education, Innovation and research for the service of humanity. 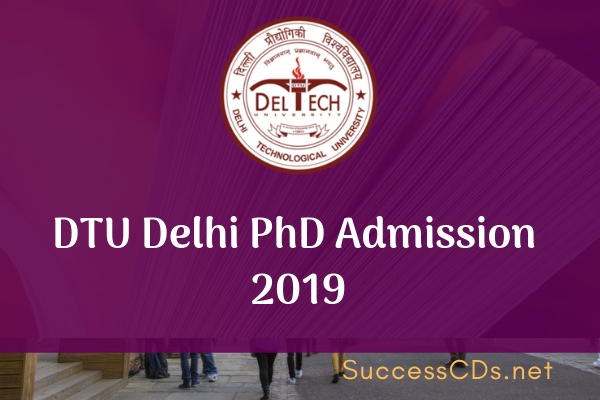 Delhi Technological University (formerly known as Delhi College of Engineering) is one of the most well-known engineering institutions of India, with over 76 years of glorious tradition behind it. DTU PhD 2019 Program offered in following the Dept. The short listing of applications possessing the minimum educational qualifications, for the purpose of screening test & interview will be done by respective departments in consultation with the PhD Coordinator nominated by the Vice-Chancellor.